Originally from Stephenville, Texas, Natalie Tiner is a freshman at the University of Texas at Austin working toward a degree in Retail Merchandising. Her goal is to work within the fashion industry in New York City. She describes her artistic style as unique yet natural, and strives to accentuate the beauties of nature by using earthy colors and flattering silhouettes. The inspiration for the design of “Psychedelic Chic”’ is 60’s flower child. Natalie loved the idea of using silky fabrics and fun colors like teal and pink to create an art bra that represented the carefree women of the sixties who promoted peace and love. 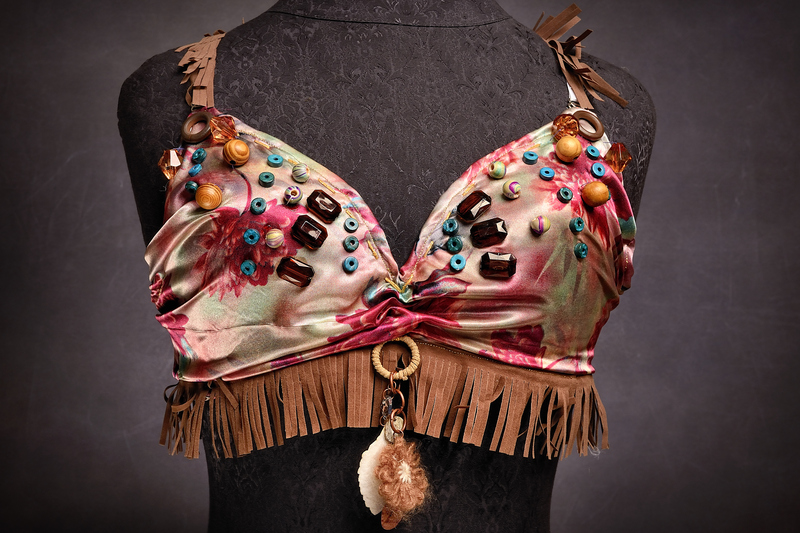 She carefully stitched the tie-dye fabric over a white bra, decorated it with geometric-shaped beads, and then sewed brown fringe to the bra’s band. The bell-bottom pants were also machine-sewn and feature a slit of teal lace at the edge of the bell. The outfit comes complete with an elastic, flower-power headband to finalize the “Psychedelic Chic” look, emphasizing femininity and true flower power.